Congratulations to New Homeowners, Jessica, Andre and their fur babies! After searching through Yelp for information, Jessica came across RemoTheRealtor and we are glad she did! She called right before one of our 1st Time Home Buyer workshops for Teachers so when we invited her to come learn more, she was completely on board! We connected them with one of our Buyers Specialists Mary and she set out to get to know Jessica and Andre’s needs and wants right away. Jessica was previously approved with Wells Fargo, however Mary suggested another opportunity to get a second opinion. Jessica and Andre were paired up with one of our amazing Lenders Partners, Luz & Fernando from New World Mortgage and within 24 hrs they had met and got them into a great down payment assistance program, which made the whole process a success! After getting the numbers right and reviewing things with Mary, Jessica and Andre knew exactly what they wanted in a home which made their home search very smooth. On top of that, they are very organized buyers! Fast forward, Jessica and Andre were in Escrow after seeing 5 homes because they knew what they were looking for. Jessica is most excited about having a yard for her dogs to run around and play, which they will definitely have the space now. Plus Mom and Dad live close by, so we have happy clients all around! 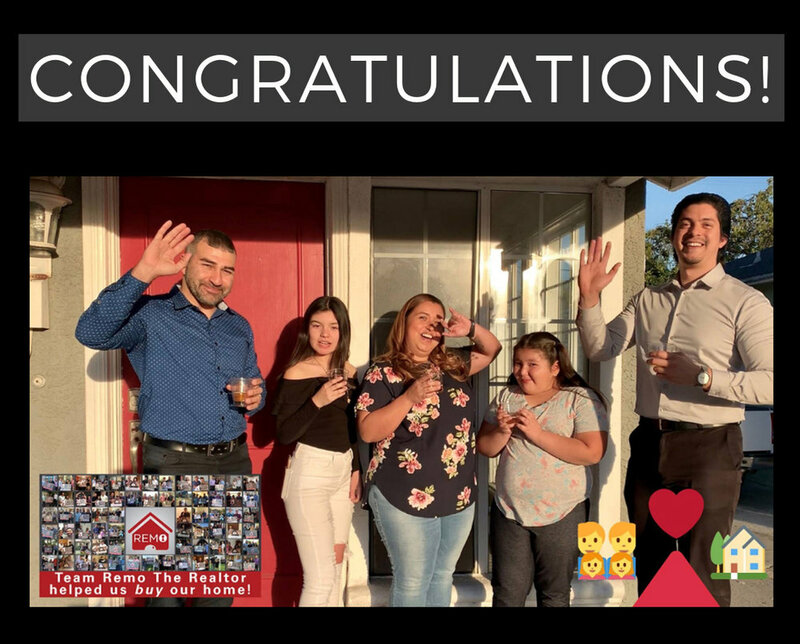 Thank you to our Lender Partners Luz & Fernando from New World Mortgage, Buyer Specialist Mary, and especially to Jessica and Andre for choosing Team RemoTheRealtor to assist in their goals of having a yard for the fur babies! & of course, Homeownership! Cheers to the new adventures and it was a pleasure representing you in the quick purchase of your beautiful new home. Welcome to the family of Raving Fans! Thinking of Buying and/or Selling in 2019, call/text Remo 562-762-8581. Congrats to the Ochoa Family on Becoming Home Owners in 2019! We connected them with one of our amazing Lenders Partners, Luz & Fernando from New World Mortgage to get their pre-approval appointment right away and they were ready to hit the ground running quickly thereafter. 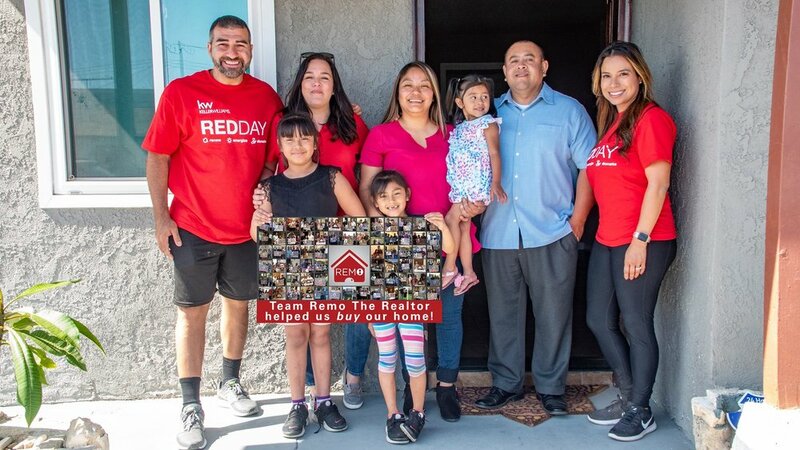 Thank you to our Lender Partners Luz & Fernando from New World Mortgage, Buyer Specialist Francisco, and especially to Elizabeth and Alvaro for choosing Team RemoTheRealtor to assist in their goal and adventure of Homeownership! Congrats to the Gonzalez Family on Becoming Home Owners in 2019! Congratulations to New Homeowners, Mark and Darlene! They were referred to us by one of our lender partners Mark Rivas who helped our past clients James and Laurie. We started looking in 2016 when the market was at its peek, Mark and Darlene knew what they wanted and only requested to see homes that fit their criteria. Great place to be in when searching. Along the way they were very patient and took their time. Fast forward to 2018, Buyer Specialist Mary came across a home in Whittier and suggested that they see it as soon as possible. Instantly they knew this was “The One”! Mary created their offer and made a point to meet the Listing Agent, which they connected instantly. The offer was presented to the seller along with a few other offers and a few days later, we received the good news that Mark and Darlene’s offer was Accepted by the Seller! Woo hoo! Mark and Darlene were very diligent and thorough with their inspections and organized with their paper work while working together with Mark Rivas of New American Funding! Thank you to our Lender Partner Mark Rivas, Buyer Specialist Mary, and especially to Mark and Darlene for choosing Team RemoTheRealtor to assist in this journey of Homeownership! Thinking of Buying, call/text 562-762-8581. Chris came to us after doing some research on Yelp.com. He came over already approved with a local lender and was ready to hit the floor running. So when he partnered with our Buyers’ Specialist, Marysol at the end of October 2018, it was full speed ahead on finding THE Home for him. After viewing 10 homes, there was one that he absolutely loved. With competing over other offers, Marysol was able to successfully get his offer accepted! Not only was Chris' offer accepted, but he also closed on Christmas Eve, and he received the keys that afternoon. Not a bad Christmas present, right? A BIG thank you to everyone who made it happen for Chris, especially Carmen at New American Funding for securing his financing, to Marysol for doing a spectacular job on finding the beautiful new home, and especially to Chris for allowing us to be part of this milestone for you! We are wishing you all the very best! Cheers to the new adventures and it was a pleasure representing you in the purchase of your beautiful new home. Thinking of buying and/or selling in 2019, call/text 562-762-8581. TJ and Heather are Home Owners Before Christmas! TJ and Heather reached out to us back in 2016 when they attended one of our Home Buyer Workshops. Right after the workshop, they got approved with a lender and were off to the races. After searching for a few weeks, we all decided to put their search on hold since there weren't too many options in the area they were most interested in. Fast forward 2 years and monthly check-ins by our awesome Buyer’s Specialist, Mary, TJ and Heather were ready once again. They went out a few weekends, and one of those times, Mary had taken both the buyers and the buyers' parents to view the homes. During that time, they were able to have a good conversation with the listing agent to start building some rapport. They later decided to put together an offer on that home and another one that they have seen. Their offer had soon got accepted on the home they really liked, and fast forward another 30 days, they were getting the keys to their new home just a week before Christmas. Before moving in, they were interested in getting a few things done. We were able to line them up with our contractor Oscar, who was able to get the floors refinished and the popcorn ceilings removed and painted. With all the work being done within the week, they were able to move in just a few days before Christmas Eve with their two fur babies (two cats)! The process was extremely smooth with the built relationships. Thank You to the Buyers for being organized and our team's awesome support!! Congratulations again to Heather & TJ! Congrats to Will and Ada for becoming Home Owners! Wilver and Ada came back after taking a break 5 years ago and were eager to get back into the search. They hit the floor running with our Buyers’ Specialist, Mary in September 2017, adopted her as honorary Auntie, and after viewing at least 40 homes, writing 7+ offers on potentials, the perfect place for them and their girls was the winner! A BIG thank you to everyone who made it happen for Wilver and Ada... Carmen of New American Funding for securing their financing, the listing agent Mark Perez KW Cerritos for a smooth transaction, to Auntie Mary for doing a spectacular job on finding them their beautiful new home, and especially to Wilver and Ada for allowing us to be part of this milestone for you and your girls! We are wishing you all the best! Enjoy the summer with Family and Friends, we will be over for a few BBQ’s! Cheers to the new adventures and it was a pleasure representing you in the purchase of your beautiful new home. Congrats to Ian and Bianca for becoming Home Owners! Ian and Bianca came to us right at the end of 2017 as a referral from one of our awesome past clients. After meeting with a lender, they were ready to start their home search and they were connected with our Superstar Buyers’ agent, Mary. Mary was heading out on vacation the day she got the call, and on the way out of town, she was already discussing Ian and Bianca’s home buying needs. After a much-needed vacation, Mary met with them in person to go over the home buying process. That very weekend, they were out looking at homes. After viewing six properties and after comparing their options, they were clear on their number one pick! Fast forward two weeks from the initial meeting, Ian and Bianca’s offer was accepted on their top choice. Since Ian and Bianca were so well organized it moved the loan process along smoothly. Thank you to Dave Heard for his partnership with the loan process and closing in just 21 days! Thank you to Mary for doing a killer job, and to Ian and Bianca for allowing us to be part of this milestone for your family. Cheers to the new partnership and it was a pleasure representing you in the purchase of your beautiful home. Congrats to Zaki and Lelian for becoming homeowners again!! Zaki and Lelian have been family friends for many years now, we first helped them about 10 years ago when they purchase their first home. With a few new family additions, they needed a little more space. We connected them with one of our lender partners, Carmen Meraz with New American Funding to confirm what they would qualify for once again. The timing wasn’t right when they met initially (3 years ago), and they decided to stay in their current home for a couple more years. This year-end, the timing was a lot better, and their search began! Carmen met with them again to update all their numbers and they were paired up with one of our amazing buyer's agent, Mary. After viewing a few homes, they found one that would be the best fit for their growing family. After writing an offer with the home only on the market for two days, Mary was able to leverage one of our existing agent relationships to get their offer accepted and open Escrow!!! Thirty days later, we are here at this special moment for the family. Thank you to Zaki and Lelian for allowing us to be part of this milestone for your family, and we can't wait for the housewarming!!!! Special thanks to Mary for knocking it out of the park for Zaki and Lelian!! Thinking about buying/selling… Call/text 562-762-8581. Congrats to Luis and Erica for becoming Whittier's newest homeowners!! Luis and Erica met us towards the beginning of the year at an open house in Whittier. The following week, Erica attended one of our homebuyers’ workshop to get educated on the Home Buying process. Shortly after the workshop, they met with a lender to get a better sense of what they qualify for. Luis and Erica decided to save a little more before purchasing, so they would be in a stronger position once they became homeowners. We agreed to put the search on hold, and when they were comfortable with their savings, they would reach out to us. Once ready got to that comfort point, they were ready to rock-n-roll with Francisco. Luis and Erica viewed about 15 homes, and saw their new home twice before making an offer. The first time was during the evening, so they had no light to properly see the exterior. They were set to view more homes towards the end of the week, and decided to put this home on the list again. After that second look, they knew this home would be a good fit for their family and Francisco started the negotiation. Fast forward 30 days, we are here at this moment. Thank you to Luis and Erica for allowing us to be part of this milestone for your family, and can't wait for the housewarming!!!! A special thanks to Francisco for knocking it out of the park for Luis and Erica!! 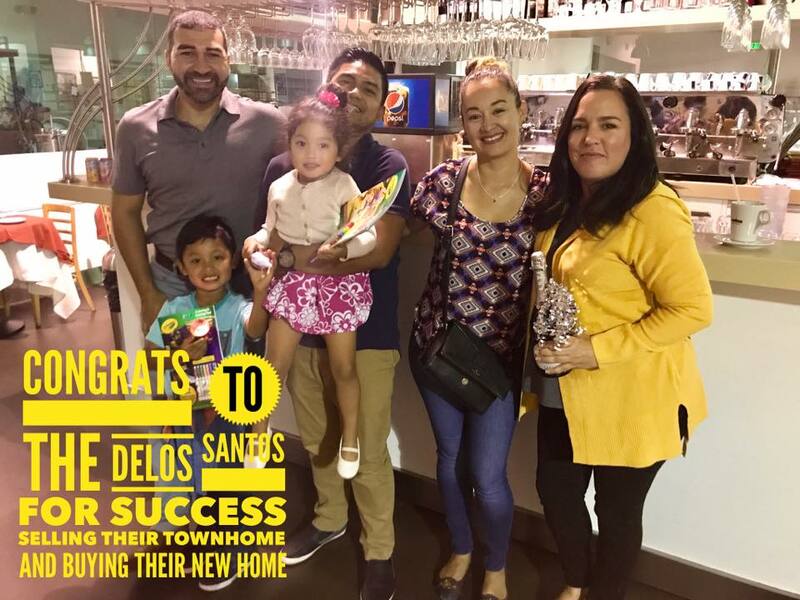 Congratulations to the Delos Santos family or successfully selling their town-home and buying their new home with her team! Winston and Evelyn reached out to us a few years ago when they first thought about selling their town home, but after some number crunching, it wasn't the right time for them. Fast-forward two years, Winston reach back out to us and said it was time because the kids needed a yard to play. We quickly got on it and within a few days, our awesome photographer Vidal, was at the home taken some killer pictures of the townhome. Once on the market and with multiple offers, our rockstar buyers' agent Mary, was on the move showing them and the little ones homes. After a few weeks of shopping, their offer was accepted and we were on our way to a quick escrow. Thank you Winston and Evelyn for reaching out to us and allowing us to be part of this milestone for the family. Thank you to Carmen with New American funding for quickly securing the financing, and a big thanks to Mary for making it all happen and being so awesome. Thinking about buying or selling, call/text 562-792-8581.